Mountain biking is a great way to enjoy the outdoors during free time. It can also be a well-paying career if you take it seriously. No matter what your reasons for riding are, you need to have the right skills for you to enjoy it maximally. Having the right skills will also help assure your safety as you get out there to ride. Here are some useful tips that will help you become the best biker you can ever be. With these you can ride like the wind, roll over rocks like a pro, climb hills without any hardships and descend even the steepest terrains with ease. A good bike will give you confidence knowing that the chances of anything going wrong while out there are minimal. The last thing you want to do is having your bike fail you in the middle of a trail forcing you to walk all the way to the end or back or worse fall and end up in the hospital emergency unit. Make sure your bike is in good condition before embarking on a riding escapade. Find out the best mountain bike within your budget. 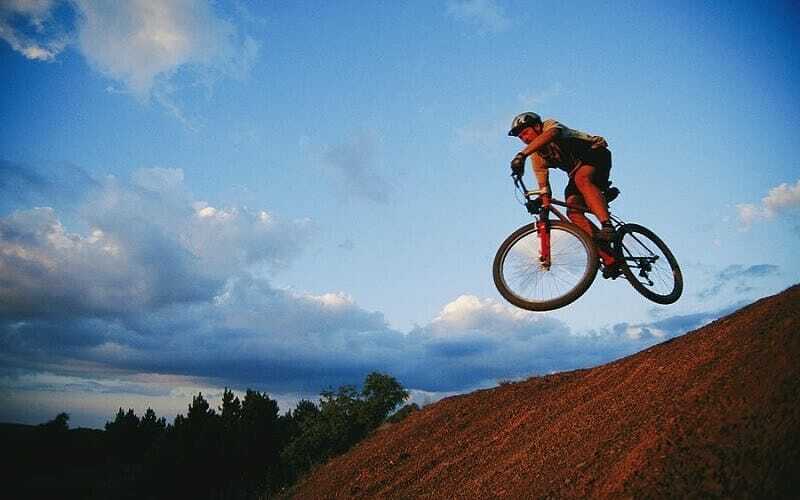 In mountain bike riding the terrain is bound to change from one place to the other and you need to be flexible in order to ride well in all of them. On flat grounds, remaining on the saddle is best practice while descending will require you to stand on the saddles. Stand tall enough to allow you room to move your body’s upper part as is needed. This will help you absorb the bumps on the terrain without any injuries. This will make the difference between a smooth stop and literally jumping off the bike. Use one finger to operate the brake lever so you still retain control over the bike. Just feather them to avoid over-braking which is the reason for so many accidents. Make use of both brakes to have better control over the bike. To help you make faster turns, practice braking before making the turn rather than in the middle of the turn. If you are the best biker among those you usually ride with, it is time to get new riding mates. Riding with someone better than you challenges you to do better and be the best you can. You could even learn some tricks from them like how to wheel. Experienced riders will know what works and what does not. Observe how they place their bodies on the bike and how they handle the rough sections of the terrain. This is the only way you can ensure you maintain speed without ramming into obstacles. Avoid looking sideways or where you are coming from as this can distract you causing you to crush. When you are focused on what is ahead of you, even the whole body follows suit. You have more control over your body and the bike which enables you to ride smoothly over any type of terrain. When you look elsewhere, you lose your concentration and balance increasing the chances of falling off the bike. No matter how tough the terrain you are riding on is, the only way to succeed is by relaxing. Many bikers will advice you not to let the bike smell your fear. No matter how tough the terrain is, keep calm and maintain the right posture. Hold the handle bars firmly but not too tightly as this will tire your hands fast reducing the control you have over the bike. Think positively and you will be able to ride through any obstacle that may come your way. To become a good mountain biker, practice is must needed. With enough experience on your bike, you gain confidence and are ready to face any obstacles. Start with rides on smooth surfaces like tarmacked roads before heading out to riding trails. The best option is to ride your bike wherever you geo whenever possible. With time, you will be able to ride over a plight of staircases and then you can venture into the wild. Start with trails near your home and then explore the world as you get better. With more practice you get better and soon enough you will be among the best bikers there are. Put all the above tips into practice and before you know it you will be among the best riders. Before you get there, however, it will take time, lots of practice and mistakes to learn from. In case of mistakes, do not dwell on them. Rather learn from them and forge ahead in your endeavor of becoming a better mountain biker. Do not dwell on theoretical learning either, get out there and put what you learn into practice. Start with these tips.